Earn 12 Loyalty Points with this product. ? Sometimes extra special nutrients may be needed to achieve maximum health. 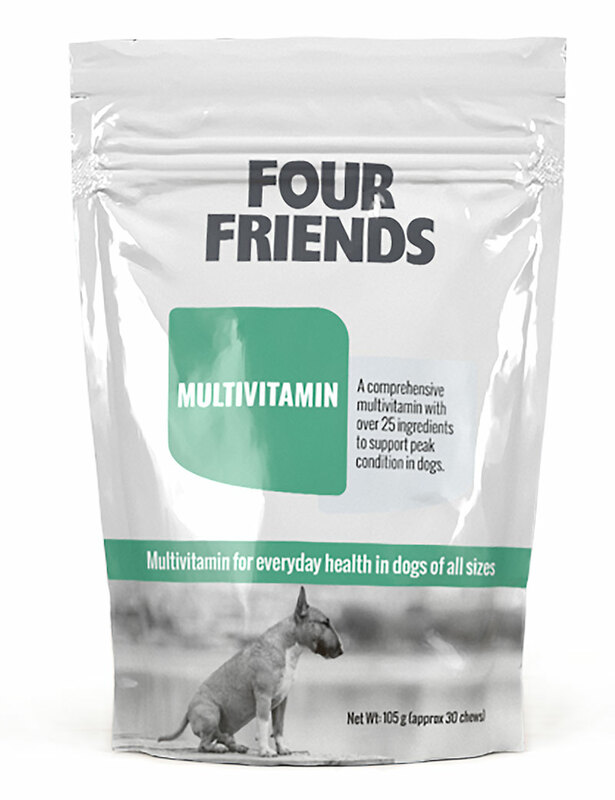 FourFriends Multivitamin is a versatile vitamin supplement with over 25 ingredients to keep the dog's general health in top condition. Vitamins, mineral, trace elements and omega fatty acids in perfect balance. Oatmeal, dried brewers yeast, glycerin, rye flour, calcium phosphate, gum arabic, vegetable flavour, calcium carbonate, rapeseed oil, lecithin soy, fish oil concentrate, 1-ascorbyl-2-polyphosphate, maltodextrin, sodium alginate, calcium sulfate, citrus pectin, water, vitamin E supplement, dl-methionine, vitamin B12 supplement, iron sulphate, ascorbic acid, zinc sulphate, niacinamide, d-calcium pantothenate, mixed tocopherols, citric acid, rosemary extract, silica, vegetable oil, propionic acid, manganese sulphate, inositol, riboflavin, copper sulphate, magnesium oxide, vitamin D3 supplement, vitamin A supplement, pyridoxine hydrochloride, sodium selenite, thiamine mononitrate, biotin, folic acid, potassium chloride, calcium iodate. There are about 30 pieces per bag.